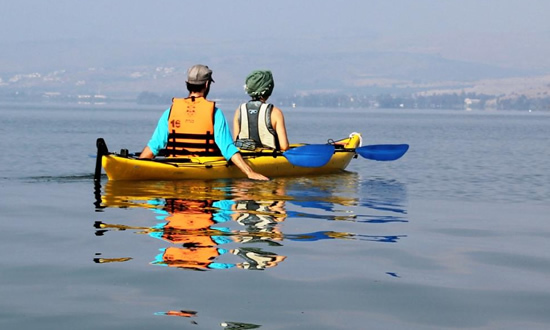 Experience the kayaking holiday of a lifetime on the historical and breathtakingly beautiful Sea of Galilee! 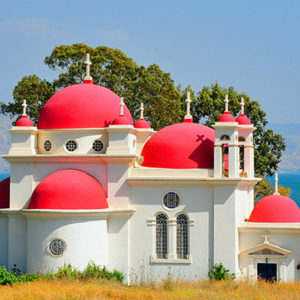 The aim of the six day tour is to enable Christian believers who are looking for a memorable holiday in the Holy Land, to paddle round the Sea of Galilee, visit the holy sites and get a special feel for the nature of this beautiful part of Israel. The tour is fully inclusive of kayaking equipment, a fully qualified guide and luxurious accommodation each night at 4 star hotels around the lake. too strong for the level of the group. Walkonwater Kayak supports our guide’s decisions. Arrival at the Hotel Rimonim Galay Kinneret, Tiberias to pick up the kayaks and other equipment. A short course in order to learn the equipment and safety measures will be followed by a visit to the citie’s ancient hot springs to see some of the most astounding ancient mosaic floors in the Middle East. 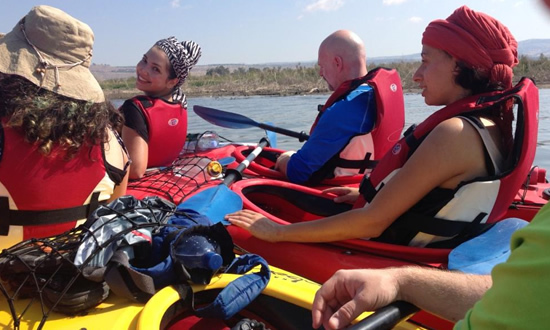 The day starts with a 10 Km paddle to the place where the River Jordan exits the Sea of Galilee and continues with a short journey along the Lower Jordan River. gives the visitor in a feeling of spiritual peace. We will follow the south-eastern shore of the lake all the way up to Kibbutz Ein Gev, where we will pay a visit to the “Anchor Museum”, an exhibit of ancient nautical artifacts from the Sea of Galilee. We will also attend a lecture on the many types of fish native to the lake, such as the well-known Saint Peter’s fish. While at Ein Gev we will take advantage of a tour round the kibbutz which is one of the most interesting examples of an exercise in communal living of the twentieth century. Lunch will be eaten at the famous fish restaurant on the kibbutz. 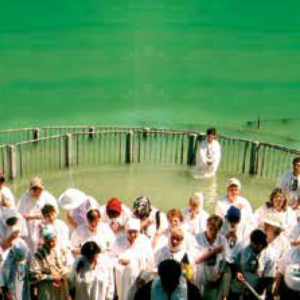 From Ein Gev we will paddle another 10 kilometers to visit the monastery of Kursi, where according to tradition, Christ performed the miracle of casting out a horde of demons into a herd of swine. 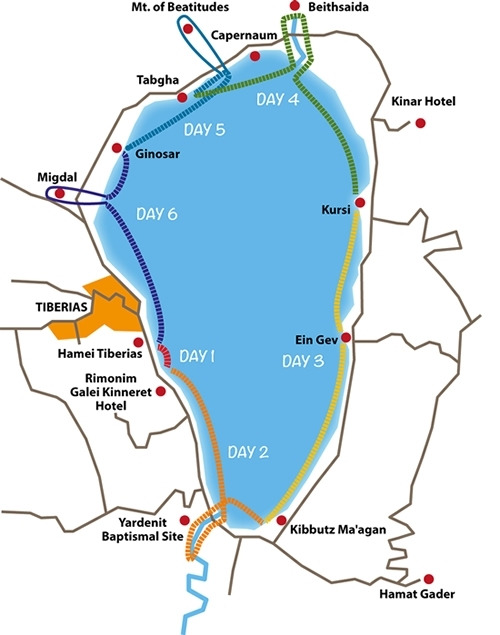 Our hotel for the evening will be the Kinar, a few kilometers north of Kibbutz Ein Gev, where the Galilee and the Golan Heights meet. 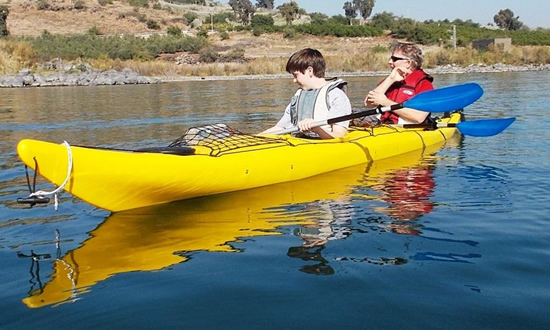 Getting off to an early morning start, we will paddle the length of the Jordan Delta and various other streams which tumble down from the Golan Heights and spend some time observing the huge variety of bird and acquatic plant life which which live in this part of the lake. Entering the Upper Jordan River we pass by the ancient fishing village of Bethsaida, birthplace of the Apostles, Peter, Andrew and Phillip. 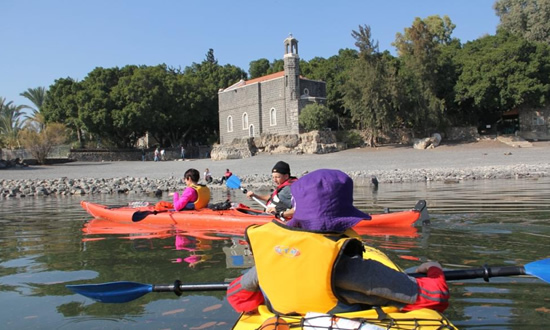 Further paddling will bring us to the Church at Capernaum, allegedly the spot where Christ chose his 12 Apostles. 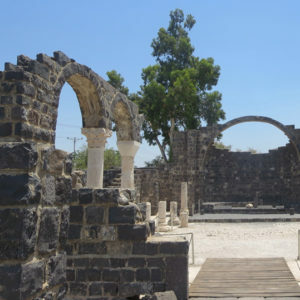 Continuing on, we arrive at Tabgha to the Church of the Primacy of Peter, where Jesus entrusted Peter to continue his work and to lay the foundations of the Christian religion. 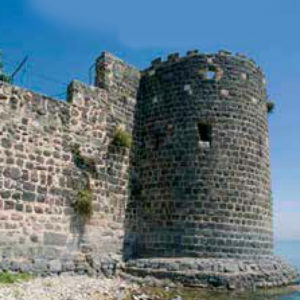 Tabgha is famous as the spot where Christ performed the miracle of the loaves and fishes, the feeding of 5000 followers. We will spend the night at the Pilgerhaus in Tabgha, built in 1889 by the Lazarist Fathers, a German monastic order. The day starts with a visit to the Church of Loaves and Fishes in Tabgha where we can see the beautiful mosaic of the of the loves and fishes, which more than anything else symbolizes the miracle of the feeding of the 5000. A short distance away, the group will pay a short visit to the house where Jesus miraculously healed the mother of the Apostle Peter. 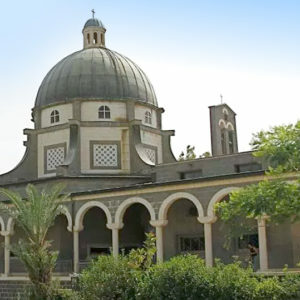 Upon returning to the kayaks, we make our way back to the Lake and climb the Mount of Beatitudes, the hill where Christ delivered the famous Sermon on the Mount. The Ginosar Hotel, where the group can take a well earned, shower, rest and an evening meal, is our final stop of the day. Ginosar is the place where in 1986, two fishermen from the kibbutz found the remains of an ancient fishing boat in the mud near the kibbutz. The boat is now preserved in a museum specially built to exhibit the boat, dating from approximately the time of Christ. 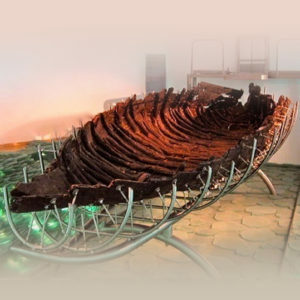 We will pay a visit to see the boat and various other artifacts from the 1st century CE. After the visit to the Museum we take to the water again and paddle in the direction of Migdal, the birthplace of Mary Magdelan. From Migdal, we will finish the tour sometime in the afternoon when we paddle into Tiberias and say farewell and a happy trip home.